Man, Oh Mann by Bart Marantz. For jazz combo (flugelhorn/trumpet, alto saxophone, tenor saxophone, trombone, guitar, piano, bass and drums). Bossa Nova, Jazz. Level 3. Score and set of parts. Published by UNC Jazz Press (NC.749). (Level III) Written for Sara Mann Marantz, this bossa nova is for combo and is open for plenty of solo space featuring flugelhorn on melody. Watch out for the horn soli section: it's a challenge. Quarter note = 144. Flugel/trumpet, alto sax, tenor sax, trombone, guitar, piano, bass and drums. Autumn's Color by Fred Hamilton. For jazz ensemble (trumpet, tenor saxophone, trombone, piano/guitar, bass and drums). Bossa Nova. Score and set of parts. Published by UNC Jazz Press (NC.576). A contemporary bossa-rock tune with excellent harmonies. Written for trumpet, tenor sax, trombone, piano/guitar, bass and drums. Bossa Del Sol by Bob Washut. For jazz combo (flute, flugelhorn, Rhodes piano, bass and drums). Bossa Nova, Jazz. Bob Washut Series. Score and set of parts. Published by UNC Jazz Press (NC.1543). A haunting bossa nova harmonically reminiscent of Clare Fischer. Scored for flute, flugelhorn, Rhodes piano, bass and drums. Serenity by Scott Reeves. For jazz combo (trumpet, soprano saxophone, trombone and optional tenor saxophone plus rhythm section). Bossa Nova, 7/4 time signature, Odd Meter, Jazz. Score and set of parts. Published by UNC Jazz Press (NC.1094). A pretty bossa nova with an intense 7/4 phrygian vamp in the middle for soloists. 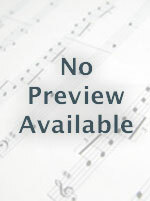 Features extensive writing and backgrounds for the soloist. Suggested scales for soloists. Trumpet, soprano sax, trombone and optional tenor sax plus rhythm section. Morning Song by Scott Reeves. For jazz combo (trumpet, alto saxophone, tenor saxophone, trombone and rhythm section). Bossa Nova. Score and set of parts. Published by UNC Jazz Press (NC.1093). A pretty bossa nova with interesting chord changes. It features extensive writing, backgrounds for two of the solos. Scales are provided for the soloists. Trumpet, alto sax, tenor sax and trombone plus rhythm section. 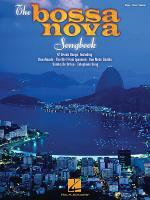 The Bossa Nova Songbook by Various. For Piano/Vocal/Guitar. Piano/Vocal/Guitar Songbook. Softcover. 190 pages. Published by Hal Leonard (HL.109307). ISBN 1476867976. 9x12 inches. 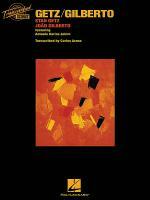 All the best bossa novas in one great collection! Features 47 tunes in total, including: Água De Beber (Water to Drink) • Águas De Março (Waters of March) • Call Me • A Day in the Life of a Fool (Manha De Carnaval) • Desafinado (Off Key) • The Girl from Ipanema (Garôta De Ipanema) • How Insensitive (Insensatez) • Little Boat • The Look of Love • A Man and a Woman (Un Homme Et Une Femme) • Meditation (Meditacao) • One Note Samba (Samba De Uma Nota So) • Quiet Nights of Quiet Stars (Corcovado) • Samba De Orfeu • The Shadow of Your Smile • So Nice (Summer Samba) • Telephone Song • Wave • and more. Getz/Gilberto. (Stan Getz & Joao Gilberto, featuring Antonio Carlos Jobim). By Joao Gilberto and Stan Getz. By Antonio Carlos Jobim. For Guitar, Piano/Keyboard, Saxophone. Transcribed Score. Softcover. 160 pages. Published by Hal Leonard (HL.1333). ISBN 1423475348. 9x12 inches. This folio transcribes every note by every instrument on the ground-breaking 1965 bossa nova masterpiece that won the Grammy Award for Best Album of the Year and produced the classic standard “The Girl from Ipanema” which also won a Grammy for Record of the Year. It features Stan Getz on saxophone, Joao Gilberto on guitar, and Antonio Carlos Jobim on piano. 8 songs, including: Desafinado • Doralice • The Girl from Ipanema (Garôta De Ipanema) • O Grande Amor • Para Machuchar Meu Coracao • Quiet Nights of Quiet Stars (Corcovado) • Só Danço Samba (Jazz 'N' Samba) • Vivo Sonhando (Dreamer). Bossa Nova Brazil! by Amy Dunker. For string orchestra. Orchestra. Level 3. Score. Duration 3 minutes. Published by Alliance Publications (A4.AP-4114-SC). Aguas De Marco [Waters Of March] (Score) edited by Rob DuBoff and Jeffrey Sultanof. Arranged by Claus Ogerman. For studio orchestra. Recorded by Antonio Carlos Jobim. Bossa Nova. Medium. Score. Published by Jazz Lines Publications (JL.JLP-8681S). In 2001 a poll of more than 200 Brazilian journalists, musicians and other artists was conducted by a leading Brazilian daily newspaper Aguas de Maro was named as the all-time best Brazilian song in this poll. The song first appeared in 1972 on the self-titled record Jobim (released a year later in South America as Matita Pere). The arrangement, featuring Jobim on Portugese vocals, was crafted by Claus Ogerman with whom, on several occasions, Jobim had previously worked. This brilliant arrangement perfectly frames the stream of consciousness song. Ogerman's instrumentation features 4 various types of flutes (see below) along with violins, cello, guitar, piano, bass, and drums. Ogerman specifies 12 violins and 5 celli and provided exact divisi instructions (which we have included). In addition, all flutes are on bass flute for 4 measures only. We have retained this but have included alternate alto flute parts in the event that bass flutes aren't available. Lastly, we have included both the original Portuguese lyrics as well as the English lyrics. It should be noted that when Jobim wrote the English lyrics he modified the melody in places. We have opted to include both melodies (in separate vocal staves) so that the vocalist has the optional of performing this in either language. Latin American Dances 2. (I. Salsa -- II. Bossa Nova -- III. Rumba). By Clifton Jameson Jones. For concert band. Grade 3.5. Full score. Published by TRN Music Publisher (TU.FSLAT5). Latin American Dances 2 is a new suite of three original dances for symphonic band which use dance rhythms from Latin America. The first movement is 'Salsa' - a fast, lively dance which has its origins in Puerto Rico and Cuba. The second movement is a 'Bossa Nova' from the beaches of Brazil, a much more relaxed and quiet style of music. The suite picks up the pace to close with a 'Rumba' from Cuba. The 3 dances in this set each use a repeating 2 measure claves pattern of 2+3 or 3+2, which is often used in contemporary Latin music. Also, each movement begins with the same 5 note motif, beginning on the 5th scale degree of the key (5-6-5-4-5) and then 'spins' out and develops melodic material within the movement. Latin American Dances 2 was premiered by and is dedicated to the Austin Symphonic Band and its director Richard Floyd.